There are things that flower growers and garden retailers can do to prepare for seasons when there is a drought. Be informed. Learn which communities have restricted water use. Massachusetts Department of Environmental Protection (DEP) maintains a Municipal Water use Restrictions Map. Advise customers to take proper steps to insure that plants get well established in the garden. the garden. The fact sheet: " Watering New Plantings" can be printed off and distributed to customers. Choose the right plant for the right place. Different plants prefer sunny, part-shade, moist or dry conditions. Many annual and perennial plants on the market are considered low- water use plants (see list below). Group together plants with similar light and water requirements and place them in areas that match these requirements. High water-use plants can be placed in low-lying drainage areas, near downspouts, or if shade tolerant, in the shade of other plants and low water-use plants in dry and sunny areas. Incorporate organic matter such as leaf mold, well-rotted manure or compost at a rate of about 25% of soil volume into the top 8-10 inches of the garden area. This improves moisture retention and soil structure. Avoid growing in raised beds. Plants in raised beds tend to dry out more quickly. If plants can't be planted right away, keep them in a shady area and out of the wind. Plant on cloudy days or in the early evening if possible to avoid stressing plants. Water early in the morning for maximum benefit and most efficient water use. Before transplanting, water plants in their existing containers. Immediately after planting, water flower and vegetable transplants from cell paks thoroughly with 1-1/2 quarts of water and larger annuals and perennials with 3 quarts. Annuals and perennials will need about 2 weeks of consistent moisture to develop a good root system and become established. Most plants will be able to tolerate dry spells once established with a healthy root system. 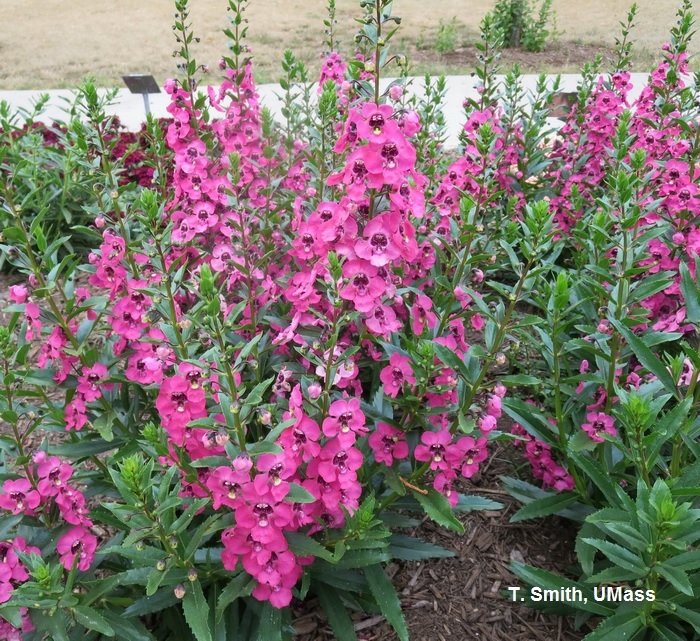 Even drought-tolerant plants need regular water until they are established. Encourage the use of drip or soaker hoses to conserve water and assure plant survival. Apply water slowly to avoid runoff and water thoroughly. Water must penetrate deeply to establish healthy roots. Avoid frequent light sprinkling. Once established, most garden plants need about 1" of rain or supplemental water every 5-7 days. Applying that inch of water in one deep watering ( to a depth of 4"-6") will encourage deeper rooting, which leads to stronger, healthier plants. Shallow, frequent watering, on the other hand, will lead to shallow root systems and high water loss through evaporation. Shallow watering, such as light frequent sprinkling, can result in wasting water while not meeting the needs of your plants. How much water is an inch of water? One square foot (12"x12") is 144 square inches. 1 sq ft x 1 inch deep = 144 cubic inches. One gallon = 231 cubic inches. Dividing 231 by 144 = 0.62 gallons (rounded). So a plant growing in about 1 square foot of soil needs a little more than half a gallon of water a week to equal 1 inch. Finally, promote the use of organic mulches such as bark chips. A 2-3 inch layer of mulch applied when soil is moist will conserve soil moisture and reduce weeds. Containers must be big enough to give roots room to grow. Consider the plant's mature size, when choosing container size. Avoid growing vigorous plants in small containers, which will become pot-bound and hold little moisture. If using unglazed clay pots, line the pot with plastic to hold moisture. Unglazed clay dries fastest and requires more frequent watering. Fill containers with pre-moistened potting media deep enough so new plants, root ball intact, can be set at the same depth they grew in the original containers. Fill in around each plant with additional media. Be sure all roots are covered and plants are anchored securely. The soil surface should be ½ inch below the rim of the pot to collect water. Drought conditions and water conservation may be an ongoing concern to your customers. Advising customers on ways to enjoy gardening and still be environmentally aware will be beneficial to your customers, to your community and to your business. Artemisia Artemisia Aster Aster spp. Echinops Echninops ritro Daylily Hemerocallis spp. Helleborus, Lenten rose Helleborus orientalis Hosta, Plantain lily Hosta spp. Verbascum Mullein Verbena Verbena spp.